Targeting sports and wildlife photographers, the Nikon D5 has a new 20.8-Mpix full-frame CMOS sensor with ISOs from 100 to 102,400 natively and extensible up to 3,280,000. According to Nikon, the higher ISOs benefit from the use of a filter array with improved light transmission. The D5 also boasts continuous shooting at up to 12 fps, with a 200-shot buffer in 14-bit RAW (+JPEG Fine — D5a / XQD model only) with continuous AF and AE, and up to 14 fps without continuous AF and AE. The new camera also boasts an all-new 153-point AF system that includes 99 cross-type sensors — three times as many as the D4s overall, and nearly seven times as many cross-type. Cross-type sensors are both vertical and horizontal line-sensitive and supposedly superior to the typical vertical-only type. Combined with the 180K pixel RGB metering sensor, this should at least theoretically improve object tracking. Other notable features include a 3.2-inch touchscreen LCD with 2.36m-dot resolution, and internal recording of UHD 4K video using a 1.3x crop mode, albeit with a somewhat restricted three-minute time limit. The new model measures 6.3 x 6.2 x 3.6” / 160 x 158.5 x 92mm and weighs 3.11 lb / 1415g, body only (with battery and cards). The D5 is available in two versions: either with dual XQD slots or with dual CF. It is available now at a body-only price of $6,499 (USD). With an overall DxOMark score of 88 points, the new Nikon D5’s sensor performance is on par with the lower-resolution (16-Mpix) Nikon D4/D4s and the Nikon Df, which use a related sensor; but it is slightly behind the Sony-made 24-Mpix sensors found in the D750, D610 and the Sony-made 36-Mpix sensors in the D800/D810 series. While the D5’s score is perhaps slightly lower than expected, the sensor still performs at a very high level overall, especially considering that the camera is being marketed to action and sports photographers requiring ultra-high-speed capture rates, and also considering that it has some 4K (UHD) video capability. Against its predecessor, the 16-Mpix Nikon D4s, the new model’s sensor has superior color sensitivity at base (ISO 100) and it’s higher than the earlier 12-Mpix D3s — though in fairness, the latter model’s base was restricted to ISO 200. At around ISO 800, all three models share a similar result. 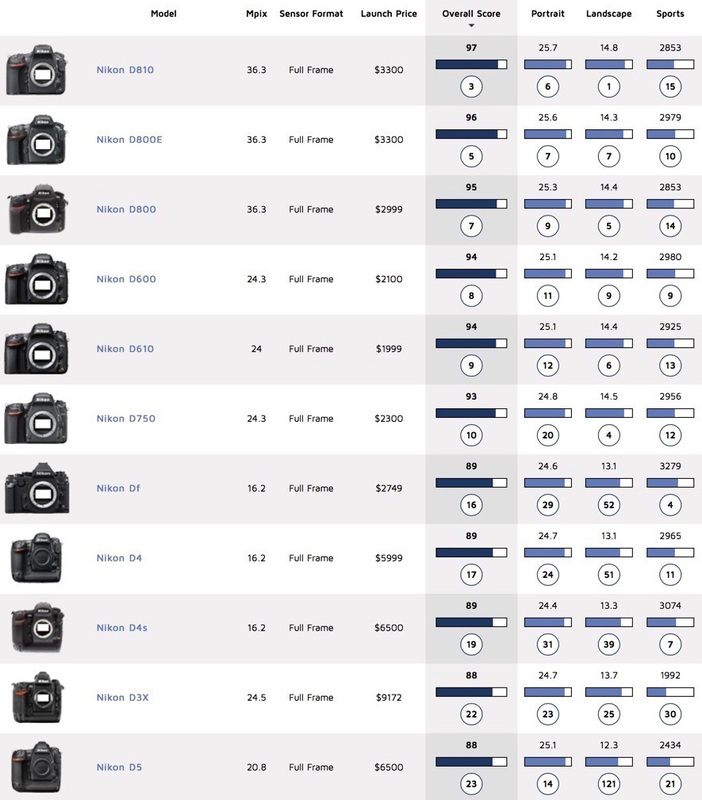 In terms of dynamic range, both the D4s and D3s perform similarly where ISO settings overlap, at least up to ISO 3200. From there through ISO 12800, the D4s’s sensor has around a one-stop improvement. Similarly, the D5 sensor has a slightly wider dynamic range over the same sensitivity range and beyond to ISO 25600, but forfeits the D4s’s excellent dynamic range between base and ISO 400. Interestingly, the new model mostly replicates the D3s at low ISOs up to ISO 400, albeit with the added advantage of the lower native ISO setting. Despite the high color sensitivity that indicates lower noise levels, the Nikon D5 comes in at just over one-third stop behind the D4s in our low-light ISO score, and around a half-stop below the D3s. In real terms that’s not a great deal, considering its advantages elsewhere, and especially when compared to competing products. At time of writing, we’ve yet to see the Nikon D5’s principal rival, the recently-announced Canon EOS 1Dx MkII. Each having a sensor with a similar resolution, the two flagship models have never been closer — but that’s a comparison that we’ll have to make another day. Against the existing 18-Mpix Canon EOS 1Dx, the Nikon D5 sensor just slightly outperforms the Canon for nearly every metric save for Low-Light ISO. As we noted previously, sensors that exhibit a mid-range gain in DR generally display slightly higher noise levels at those higher ISOs. Even so, the Nikon D5 is still only around a quarter stop behind the EOS 1Dx. The 24-Mpix Leica SL, our second comparison camera, is an outlier, though the high burst rate (albeit with a rather small buffer) and 4K video, not to mention price, make it a contender on paper. At first glance, the sensor performs very well, achieving the same overall score as the Nikon D5. However, most of the advantage is gained at low ISOs, where it excels. It doesn’t perform quite as well as either the Canon EOS 1Dx or the new Nikon D5 for low-light DR or low-light ISO, being just over one-third stop behind the Nikon in the latter category and a stop-and-a-half or so on average above ISO1600 in the former. Moving from a 16-Mpix to a 20.8-Mpix sensor is quite significant for professionals, and the improvements in high ISO DR are useful in a camera like this. In terms of sensor resolution, the Nikon D5 now matches the admittedly aging Canon EOS 1Ds Mk II, a camera still widely used for magazine features (think double-page spreads) as well as commercial photography. While it’s true that models such as the Nikon D810 (and the Canon EOS 5DS and SR) are arguably more suited now for that kind of work, the Nikon D5 nonetheless represents a tipping point in all-around capability. 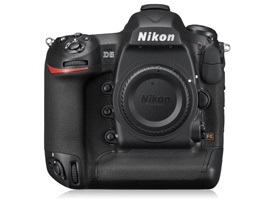 With its excellent sensor performance, phenomenal AF system, impressive burst rate and durable build, the Nikon D5 is clearly optimized to appeal to those targeted by the company’s marketing department, yet its capabilities should also entice other kinds of photographers, whether they own a Nikon D810 or not.